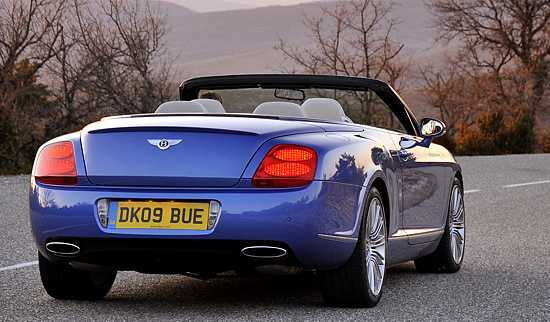 600bhp were listed as power output of the Bentley GTC Speed. Thus the model had gained a 9% increase against the 552bhp of the convertible’s ‚mainstream variant’. However no strengthening modifications in the true sense of the word had been considered necessary as regards body or suspension. Such was an impressive indication of the tremendous reserves these components of the drophead coupé had had from the very beginning. Neither was there any feeling - not for a moment – the rigid steel-structure of the Continental GTC Speed was stressed to a limit. 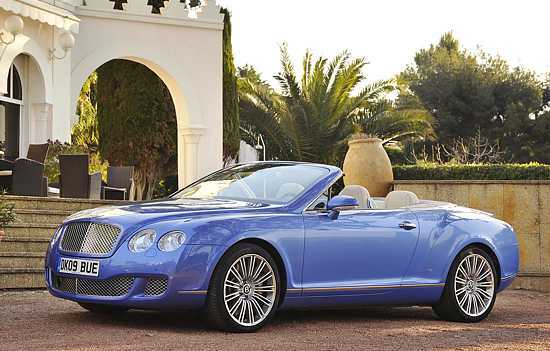 When in January 2009 the open-drive Bentley Continental GT Convertible Speed was launched it did complete the range of Continental GT Speed (fixed head coupé, introduced 2007) and Continental Flying Spur Speed (4-door saloon, introduced 2008). Compared with the ‚standard’ Bentley Continental GT Convertible certain modifications became obvious. The twin turbo-charged engine not only provided 600bhp but 750 Nm torque, too, and that was available over a broad range from 1750 rpm up to over 5600 rpm. To enhance handling and roadholding it had been decided to lower the car by reducing ground clearance at the front by 10mm, at the rear by 15mm. Springs, stabilizers and dampers’ controls were subject to fine tuning and the variable power assisted steering had been set to slightly different parameters. Stiffer rear axle bushes were fitted and improved axle control and turn-in response. Superior grip and very precise steering response were guaranteed by bespoke 275/35ZR Pirelli PZero “Ultra High Performance” tyres fitted to 9.5Jx20in multi-spoke alloy wheels, unique to the GTC Speed. The driver had the choice between two fully automatic modes (Drive or Sport) of the 6-speed transmission or sequential ‘manual’ operation via centre gearlever or paddles mounted behind the steering wheel. If he or she had the standard-fit tyre-pressure monitoring system (TPMS) fed with the data of tyres and speed-range an alarm-signal was triggered if the speed was too high for the tyre pressures or if speed ratings of mud and snow tyres were exceeded. Any driver remained on the safe side who tested the exhilarating acceleration (0 to 60mph in 4.5 seconds) and the exceptional top speed. The latter was ‘two ton’ with hood up, hence the Continental GTC Speed as a 200mph car was the fastest convertible that had ever been produced by Bentley. That ‘hood down’ took its toll couldn’t be entirely countered even by aerodynamic features like a spoiler fitted on the trailing edge of the bootlid providing additional downforce – top speed was reduced to 195mph. Adaptive Cruise Control (ACC) was available. The sophisticated follow-to-stop, radar-based system employed a front grille mounted long-range radar sensor to monitor the road ahead for other vehicles. If a slower moving vehicle was classified as an obstacle, automatically the throttle or brakes were adjusted to maintain safety distance. Safety could be upgraded, too, by investing in the optional carbon-ceramic brakes. Their large diameter (420mm front, 356mm rear) discs combined the advantages of light weight – with a considerable reduction of ‘unsprung mass’ – and exceptional fade-resistance. In a ‘worst case scenario’ two reinforced steel hoops deployed in fractions of a second when a potential roll-over situation was detected; this rollover protection systems was installed beneath the rear headrests. It was typical Bentley-manner that neither engineers nor designers had fallen victim to the trap to reduce the Continental GTC Speed’s image to that of a brute high-performance driving machine. Those owners or users who where interested in technical aspects only in so far that these in combination with permanent all-wheel drive should guarantee outstanding speed, ride and handling did find their expectations of what a luxury Convertible can achieve fulfilled by a multitude of details from the interior. The name Mulliner – in the past a coachbuilder of highest reputation – stood for more than an echo from the bygone era of bespoke coachbuilding. The interior of the GTC Speed based on the ‘Mulliner Driving Specification’ and that featured diamond quilted hide seats, a knurled chrome and hide gearlever and an endless list of further options to optimize a car as per an owner’s individual preference. As regards the GTC Speed’s outward appearance there were but subtle design enhancements: a more upright radiator grille with a more pronounced square edge, a widened lower air-intake and chrome headlamp bezels were introduced on the ‘standard’ convertible at the same time. Typical Speed-features were only a dark-tinted matrix grilled to the upper and lower air-intakes, a black lower bumper valance and rifled exhaust tailpipes of increased width. Worldwide sales of the previously launched coupé had shown that two thirds of customers acquired the GT Speed with only minority opting for the ‘standard’ variant. The company was keen to repeat a similar sales success with their GTC Speed versus the basic GTC. W12-cylinder-engine (72deg angle between two main banks, 15deg between staggered cylinders), bore x stroke 84 x 90.2 mm, capacity 5998 cc; 4 valves per cylinder, chain-driven double overhead camshaft per bank; Bosch Motronic ME7.1.1 digital engine control, twin turbochargers, air to air intercooling; 600bhp / 610PS/449KW at 6.000 rev/min; torque 750 Nm / 553 lb ft between 1750 – 5600 rev/min; permanent all-wheel drive; 6-speed automatic gearbox with fully automatic or sequential ‘manual’ operation with paddleshift feature, torque converter lock-up clutch; front suspension gour-link double wishbones, rear suspension trapezoidal multi-link, front and rear electronically controlled self-levelling air suspension, anti-roll bars; dampers with 4 adjustable settings; ASR electronic traction control, Bosch ESP 8.1 electronic stability program, TEVES ventilated disc brakes front 15.9in diameter (405mm) and 1.4in (36mm) thick, back 13.2in diameter (335mm) and 0.9in (22mm) thick (optional – with 20in wheels - carbon/ceramic cross-drilled discs 420mm diameter front, 356 mm rear) anti-lock Standard ESP and EBD (Electronic Brakeforce Distribution); kerbweight 5478lb (2485kg), wheelbase 108.07in (2745mm), track front 63.9in (1623mm), track rear 63.3in (1607mm); tyres Pirelli P Zero UHP 275/35ZR20 (optional 275/30ZR20 Pirelli PZero UHP) on 9.5Jx20 alloy wheels; electronic tyre pressure monitoring; max. speed with hood closed 200mph (322 km/h), 195mph (312km/h) with hood down, 0-60mph 4.5 sec (0-100km/h 4.8sec).